Piano Listening For Kids is a ninety minute program designed for youth aged 11 thru 17. The workshop consists of comparative listening, guided discussion and other activities designed to develop a sense of independent investigation and personal curiosity at the piano. This program is for piano students and those interested in the piano. For more information, please click the "Contact Me" tab to your left. The debut presentation of Piano Listening For Kids took place on Saturday, February 9, 2019 at the Log Cabin located at the Bradley Museum in Mississauga. Below are some photos from this unique venue. 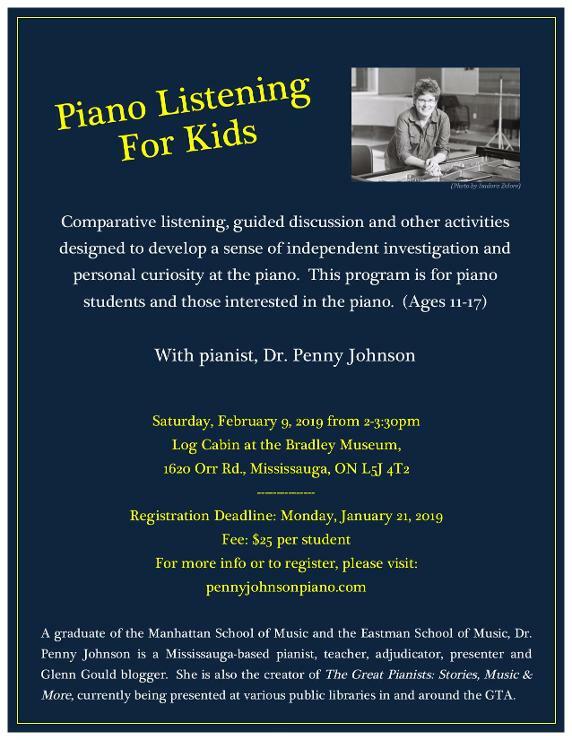 Flyer from the first presentation of Piano Listening For Kids at the Log Cabin located at the Bradley Museum in Mississauga, February 2019.